The playoffs draw closer for Bayern Munich and further for Khimki Moscow. 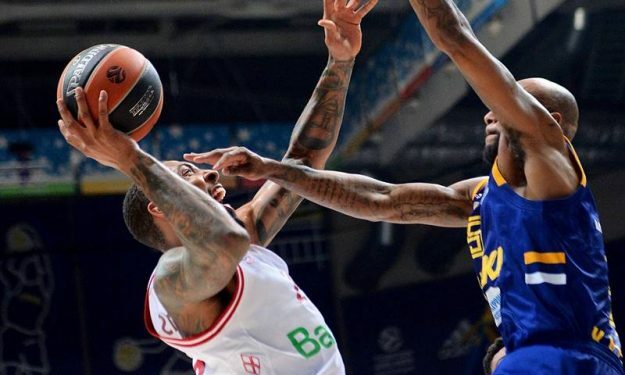 Derrick Williams scored 20 points and grabbed five rebounds, leading Bayern Munich to a 71 – 60 road win over Khimki Moscow after a comeback from 18 points down. This victory improved Bayern to 10 – 10 and kept them on a postseason course. In coach Rimas Kurtinaitis’ return, Khimki suffered a potentially decisive loss since it dropped to 7 – 13 and two wins further from the playoff zone. “The first ten minutes of the game were awful for us. We settled down and the last three quarters show the kind of team we are. Resilient. We came to play then,” Williams said in his post-game flash interview. Williams dropped 13 points in the second quarter to help his team recover from a deficit of 18 points, 10 – 28, at the beginning of the period. Thanks to him, the margin closed to five, 40 – 35 at the break. The Alexey Shved-less and Anthony Gill-less Khimki looked empty of options in the third quarter where the team was restricted to 10 points. On the other end, the Bavarian squad answered with 21. With Vladimir Lucic (15 points, four rebounds) and Nihad Djedovic (10 points) adding their piece, the visiting squad proceeded to establish and preserve a lead around double-digit numbers for the remainder of the match.